Great Lengths uses 100% natural Indian Temple Remi hair; all hair cuticles are facing the same direction and do not tangle. It is of extraordinary quality as it has never been exposed to harsh chemical treatments. In addition the proceeds received by the Temple for the hair provides funding for schools, hospitals and orphanages. While other companies use techniques such as welding, waxing, gluing or knotting, which strain and very often damage your hair to a high degree, Great Lengths is based on a much more gentle principle: modulating. 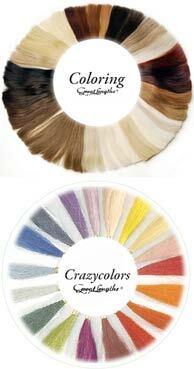 We have created an extremely high-tech method of bonding between the Great Lengths strand and your own hair. This point of attachment is composed of polymer chains whose molecular structure is very similar to that of human hair. It is activated by our Great Lengths applicator and bonds the Great Lengths strand with your own hair in this way; it is easily removed by an expert. Most important of all: your own hair is not damaged. This patented attachment of Great Lengths to your own hair offers you perfect freedom in organizing your leisure time and in your freedom of action but in no way compromises the quality of your own hair! You can see examples of how hair extensions will change your looks in our Hair Gallery. We are a Certified Great Lengths Salon. Use this link to visit the Great Lengths website. Great Lengths keratin is designed for compatibility with heat, water and sunlight; your hair extensions will last until you decide to take them out. Great Lengths hair extensionist have been professionally trained and certified to provide only the highest quality hair care. 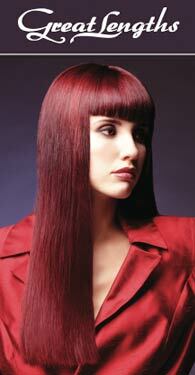 Hair extensions are applied in neat rows by selecting very fine triangular sections of your hair. Great Lengths keratin is pre-applied to the trimmed end of each hair extension. The hair extension is then fused with your natural hair creating a 'natural' bond. Once the hair extension application process is complete, we will cut your hair to the desired look and then style it. Following the application of your new hair extensions, it is extremely important that a mainenance and follow-up schedule be developed. Remember that regardless of how natural and real your hair extensions look and feel, they must be properly cared for to ensure long-lasting beautiful results. We will tell you exactly how to care for your new hair extensions before you leave the salon that day - including what are the best hair conditioners and styling tools. What ever your lifestyle, hair extensions are the perfect answer to beautiful hair. Call us today at 214-783-3798 to schedule your hair extension appointment.